The CATTIER Organic Sunny Shower Gel cleanses the skin, leaving it soft, moisturised and subtly perfumed. Fragrance-free, it takes you into a fruity dynamizing garden with notes of apricot and honey. With Cattier Apricot & Honey Body Wash Gel, your skin is soft with a fruity sunny scent ! 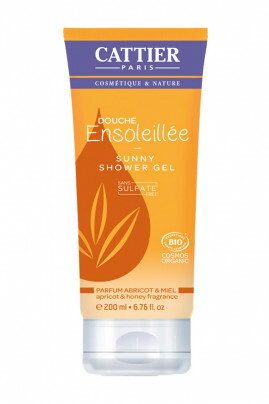 CATTIER Organic Sunny Body Wash Gel gently cleanses your skin ! Generously apply on the skin and make it foam then rinse with water. 0% SULFATES with CATTIER Apricot & Honey Shower Gel !